This dish is scented with saffron and has a rich, smoky tomato flavour. Swiss Deli Spanish Chorizo is the perfect sausage for this recipe. With its smoked paprika, chilli and red wine flavour it really adds depth and savour to the dish. 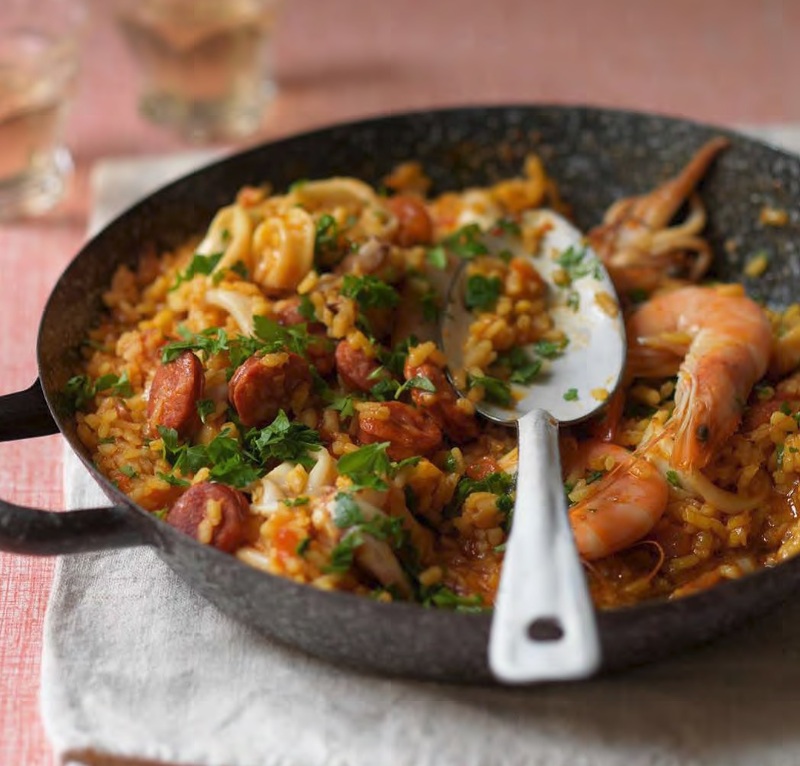 Don’t worry if you don’t have a paella pan – use a large wok instead. small bunch of flat leaf parsley, roughly chopped. 1 - Fry the garlic, shallots and Swiss Deli Spanish Chorizo in the olive oil over moderate heat for at least five minutes, stirring frequently. 2 - Add rice. Keep the pan on the heat and ‘toast’ the rice for a couple of minutes, stirring constantly so it doesn’t stick. 3 - Add half the stock, the saffron and the tomatoes and cook gently until the liquid has been taken up by the rice. Add the rest of the stock and, once it has come to the boil, add the squid and shrimp. 4 - Simmer the rice until al dente, stir in the parsley and serve.